Do you want to generate more revenue for your cremation business? Here’s how Andy Rumph, owner of Woodland Cremations & Funerals, did just that. A few years ago, Andy expanded his cremation operation so that he could service customers across the states of Indiana and Kentucky. Through satisfied word-of-mouth referrals and effective online marketing, Woodlawn Cremations & Funerals began receiving an influx of price shoppers from both states. Andy knew that if he could convert more of these price shoppers, he could grow his business faster. With Parting Pro’s automated inquiry management system, Andy increased his price shopper conversion by 50% without being pushy. Additionally, Parting Pro’s beautiful online checkout increased his merchandise sales by 8%. These improvements resulted in an additional $3,200 per month! Are you getting more cases than your business can handle? Here’s how August Heinz, owner of Family Care Cremation, is able to grow his business without needing to hire more staff. August is both a millennial and a 3rd generation funeral director. He understands that his customers may prefer to handle funeral arrangements from the comfort of their own home. In order to reduce their burden, he would often drive out to the families for the arrangement. With Parting Pro, Family Care Cremation customers are able to choose services, buy merchandise, sign digital forms, and pay - all from his existing website. August estimates that Parting Pro’s software has saved him over 2 hours per case. Parting Pro has helped Family Care Cremation expand their service area while reducing the unnecessary busy work of his staff, giving August valuable time to focus on growing his business. Do you need something that can grow your cremation business, immediately? 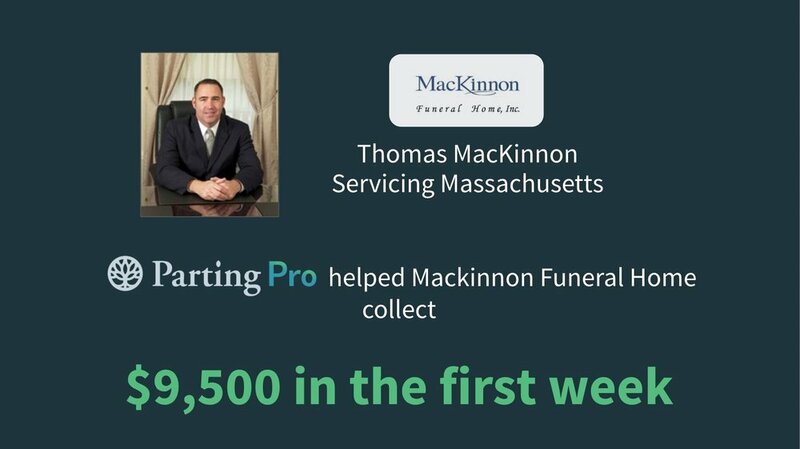 Here’s how Thomas MacKinnon, owner of MacKinnon Funeral Home, got almost $10,000 in direct cremations in the first week through Parting Pro. Thomas signed up with Parting Pro to get more organized, but soon discovered it did so much more. With Parting Pro’s invoicing system, MacKinnon Funeral Home took in $9,500 worth of online payments in the first 7 days of signing up. Now, Parting Pro secures payment for every case because it’s easier for his customers and gets him paid faster. MacKinnon Funeral Home is a one man shop. Thomas handles everything from talking with price shoppers to returning the cremated remains. As you can guess, he had a lot on his plate and sometimes, things slipped through the cracks.